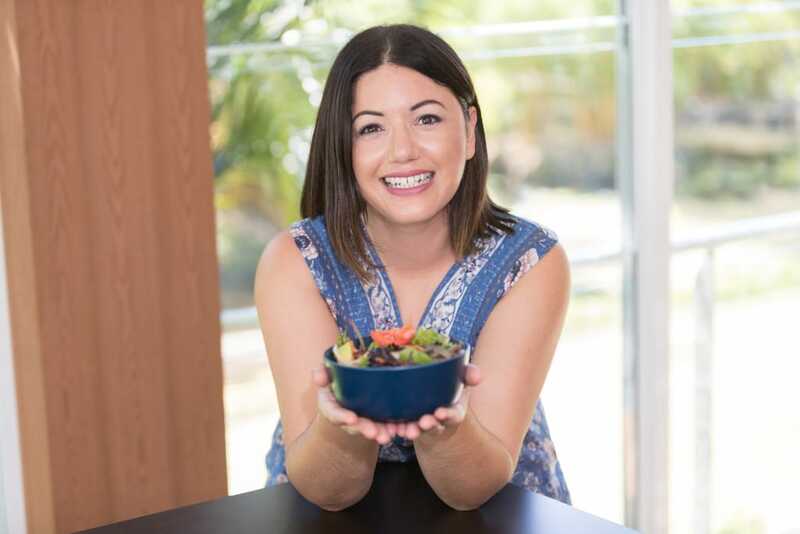 Welcome to the latest edition of my Friday Foodie series, where each week I feature my favourite health and wellness stars. Each week, they share their tips for healthy living and their favourite recipe. This week I am featuring the beautiful Chantal Roelofs from www.chantalroelofs.com. Chantal is one of the amazing ladies who I met through the Bright-Eyed and Blog-Hearted course, and I have developed a great friendship with. She is super inspiring and a really beautiful person. I also had the privilege of attending one of her kombucha workshops when I was in Brisbane and I really want her kitchen (it’s gorgeous!!). Tell us a little bit about yourself, your family, what you do and what inspired you to lead a healthier lifestyle? My name is Chantal Roelofs. I live in Brisbane with my husband and 2 girls (6 & 2 years old). Rumi’s quote “Respond to every call that excites your spirit” sums up how I live my life. I have been tweaking the perfect balance to achieve my best life for quite some time. I love to connect the dots and make sense of them to weave the best lifestyle for myself. A bit more of this….a bit less of that I have found to be a good way to move forward. Whilst I started out as a marine scientist, I quickly knew that working with a human landscape was for me. That realisation took me to working with Aboriginal communities across northern Australia – firstly in regional marine planning, and then project managing a large cultural heritage mapping and a national heritage listing process (which was successful for the 20 tribal groups – yay!). After having children – I continued to work as a consultant through short bursts of work – but the time away from home wasn’t working for me or the family. So I thought I would take what I had been doing with groups of people to a one on one scale and completed a life coaching course last year with the Beautiful You Life Coaching Academy. Best. Decision. Ever. I now work with amazing women (and a few men too) bringing more clarity and alignment to achieve a life (and often a business) they love. Nourishing people mind – body – and soul is important to me…and underpins what I do. I have developed a kombucha making course (run once a month – and Vanessa has done my course), proud to be a Wellness Advocate for integrating the safe and healthy use of dōTERRA essential oils into peoples lives, and recently became a “Speaker” speaking to groups on developing healthy and expansive “Mindset” for moving forward in life and business, and “Developing Online Presence”. So as you can see….a multi-dimensional and passionate “What I Do” answer. To sum it up – I live my life to experience expansiveness, freedom, abundance, connection, consciousness, joy, and vibrancy. That is what makes my heart sing. I have had two major life prompts to lead a healthier lifestyle – the first was my inability to fall pregnant for 3 years, when Ant and I first started trying to conceive. My naturopath found that I wasn’t tolerating wheat and refined grains and sugars well …so an overhaul in diet was in order. A conscious mixture of diet, acupuncture, Chinese medicine, and reducing stress…and an overseas holiday did me the world of good…and we fell pregnant naturally within months. The other prompt was our first daughter developing severe excema on her face and arms at 3 years old. Another visit to our naturopath found that she was intolerant of wheat and dairy….so the whole family had another diet overhaul, and we all feel so much better for it. We continue to avoid wheat, but include sourdough spelt bread which we all seem to be able to tolerate quite well. What tips would you give to someone who has just commenced living a healthier lifestyle? Keep it going – you are doing great !!! Get rid of the motto “Everything in moderation”. If you know you don’t do very well on various foods – eliminate them. Make friends with people with similar food philosophies as you. In person, online, through discussion groups…they are out there, and they will support you. A client of mine had system of “swapping” – she would swap her normal go-to unhealthy choice – for an equally yummy healthier choice. She thought it out, and was prepared for those cravings. I thought that was pretty neat. Do you have any tips for eating well on a budget? Buy in bulk. When discount days come up at the local health shop…I like to buy items we use regularly in bulk (raw cashew huts, almonds, pecans, hazelnuts, shredded coconut, chia seeds, cacao etc) – which saves quite a bit of coin. Make in bulk. My favourite thing to do is make meals in bulk and have several portions in the freezer ready to go. This help avoid the “oh – lets just get takeaway” when life gets busy…which can quickly blow the budget and lead to less healthy choices. How do you deal with food struggles from your children and/or family? Gently. I like to foster an intuitive eating philosophy in our house. Miss 6 is our fussiest eater of the moment. If Miss 6 doesn’t want something, she can be pretty stubborn. We chat about it, find underlying reasons, and don’t force her to eat anything. I do encourage trying new things, and put the “new” item in a special little dish next to her plate. Once she sees something a few times, she gets the courage to just nibble, or have a little taste. She tried her first kashmiri curry that we love to cook just a few days ago (no chilli, but heavily spice driven with star anise, turmeric, cumin, ginger and garlic) – and she loved it. Having pappadums and rice to dip into helped a lot. I also like to have my girls help with gardening, shopping and preparing foods. I they have had a hand in the cooking process somewhere, they are more likely to eat those foods. We have 10 chickens, and the girls have their chores in caring for chickens and collecting eggs. Having this role at home has meant that any recipe calling for eggs is a favourite. Miss 2 loves to “mix” eggs at any opportunity (even if I don’t need an egg!). Oh my….so hard to narrow down. My favourite food has a philosophy behind it…consciously thought about – where the ingredients come from, the intention behind the cooking (for instance…cooking special dinners or lunches for friends would class as “my favourite foods”), the balance of flavours, a well set table in a gorgeous environment….can all add up to “my favourite food experiences”. If I have to choose…it would probably be a slow cooked lamb dish of some kind (sumac, cumin spiced lamb – slowly roasted for 12 hours at 100 degrees – or a Moroccan lamb casserole – or a Kashmiri lamb curry). Who is your favourite foodie and why? I am inspired by foodies that have a conscious philosophy behind what they do. Vanessa – you inspire me, with your background, how you approach food, and bringing creative, thoughtful and healthy choices to a big audience. Pete Evans also inspires me how is brings his message to a wide audience, and has courage to stand up for what he knows is his truth. What is something that you enjoy doing when you have some ‘me’ time? I like finding stillness. Immensely. This can be in a yoga class, doing a guided or a solo meditation, feeling sandy and tidal sensations on my feet at the beach, getting perfect neutral buoyancy whilst scuba diving (where I can hover in water effortlessly and single breath moves my still body ever so slightly) or just finding it in the “right now”. I am at a local library while Miss 6 is at school, and Miss 2 has half a day of childcare – and if feels luxurious not having constant distractions while I am writing this piece for you. Ah serenity…I love it. What is your favourite recipe to cook? Wheat and dairy free Banana bread – more like a cake though! Preheat oven to 180 C degrees. Pull out your food processor. It will make life a lot easier. Add your cashews to the food processor to grind down. Once your get a fine cashew meal, add your walnuts and oil while your food processor is still on until you get a cashew butter. Peel your bananas, roughly break them up, and add to your food processor with the cashews and walnuts. Turn your food processor on and let combine for a minute or so until you have a soupy paste. Now in a large bowl, whisk your eggs, then add your cashew/ walnut /banana mixture along with almond meal, bicarb of soda, baking powder, honey, vanilla extract, cinnamon, and salt. Mix to combine until you get a batter. Line and grease a bread/ rectangle cake loaf pan with some oil. I used a loaf pan that is 11cm x 22cm (tapering to the base a bit) and it works well. You could use larger for more squat loaf of bread, just may cook for less time or differently. Pour batter into your greased loaf pan. Place in oven and bake for 40-50 minutes or until bread is cooked through (put a skewer in to see if it comes out clean) and the top of your loaf has a bit of a “crisp” to it. Let bread cool for about 10 minutes. Enjoy !! The bread will keep beautifully in a container in the fridge for about a week….but doesn’t last that long in our house. Chantal Roelofs is a coach to motivated change seekers – working with small business owners, mums seeking to rebirth themselves after raising children, and people wanting to forge new directions to live their lives with purpose and passion. She is a consultant to a range of groups and organisations in visioning, strategic planning, writing and community engagement. Her extensive background in marine science, policy development, cultural and natural resource mapping and management, and social research gives her not only a unique perspective, but also the practical ability to assist many people and a diverse array of groups to navigate pathways forward towards their visions. She is passionate about making dreams become a “reality”. Chantal lives in Brisbane with her husband and two daughters. Starting the day with a meditation, followed by a hot cup of earl grey tea while watching the sunrise is her kind of thing. Whilst camping = even better. She enjoys working with a diverse range of clients in Australia and overseas and connecting with Aboriginal communities and organisations through consulting work, and with a range of people through the online world. She is currently developing two e-courses which will both launch late 2015. I love to create simple healthy recipes from fresh and whole ingredients that your entire family will enjoy.